Konitsa Refugee Camp protests in northern Greece, 1-3 September, 2016. Lampros Raptis. 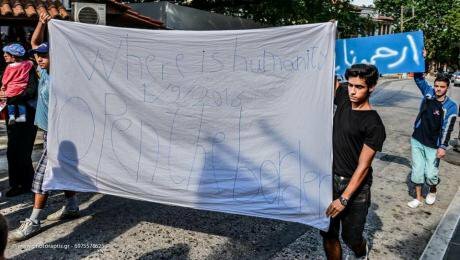 All rights reserved.At the start of September 2016, I - along with thousands of other Syrians currently living in refugee camps - took part in street protests, peaceful sit-ins, strikes and marches in the cities where the camps are throughout the whole of Greece. You may not have seen information about the strikes or protests in the news. It is difficult for us - with little support, contacts and power - to get the information about this out, to talk directly to the people of Europe. We have kindly been given this platform in openDemocracy in order to address you, the people of Europe, directly. 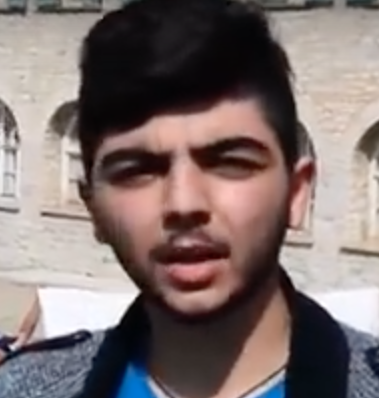 We have been demonstrating because we need to ask for three things: (1) that the EU opens the Greek borders; (2) that better care is provided for refugees such as ourselves in the camps; and (3) that we be treated with dignity – as human beings, not as animals – and that we are able to achieve a future where we can live as we hope, in peace and in dignity. The most important aim of the strikes and protests is to send the message to the Greek government and the EU that we need you to open the border, to let us into the rest of Europe. Everyone of us is asking that the borders be opened, or else that you find other ways for us to continue our journey. We recognise that there are steps being taken to reunite families and help minors trapped here without their parents or families – through the UN relocation and family reunion programme – but it is slow and we do not know how long it will take before we will see our families and loved ones again. As such, it has to be made faster. Konitsa Refugee Camp protests. Lampros Raptis. All rights reserved.Secondly, we need the camps to take better care of us. If you saw some of the camps in Greece, you would see that many of the camps are not able to provide even the basics: food, clothes, money, medication, care for children. In the majority of camps, all these things are lacking or are not of an acceptable, human standard. We are all asking that we are taken better care of. We need normal food and the opportunity to cook for ourselves, like normal people. We need housing. We need clothes, proper medication and healthcare. The clothes that we have are of poor quality and we need shoes, jeans, shirts, jackets – especially now that summer is ending and winter comes. And most importantly we need money, or some way of earning money and supporting ourselves. Many of us want to work, we want to support the local economy, but we are denied this opportunity. Many of us are well-educated, and skilled workers. But now we are broke and we need to ask for so many things, as we have no money to buy things we need. 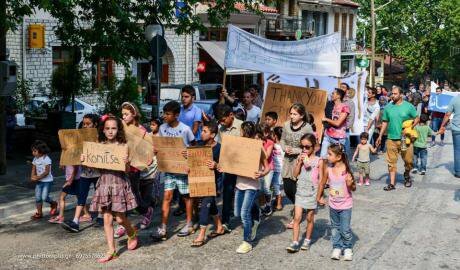 Konitsa Refugee Camp protest. Lampros Raptis. All rights reserved. As well as facing difficulties with food, clothing, medication and shelter, we face other problems. We have all faced a difficult journey from Syria to Greece. We have lost our homes, the streets and the towns we grew up in. We have lost family members. We have lost contact with many of our friends and lovers, many we may never see again, many we know have died. We have paid thousands of dollars to leave Turkey, to travel over seas in a dinghy, and have suffered violence and brutality at the borders of Europe. Many of us need psychological care and support. And many are suffering from psychological pain and boredom, since the authorities are not able to tell us how long we have to stay in Greece, with some preferring to return to the war in Syria than to live a hopeless life in Greece. Yazan Al-Shrif, the author of this piece. Finally, we ask to be treated in a way in which we can achieve a future where we can live in dignity. We are humans, but in many cases we are being treated like animals. We want to reach other countries in Europe, where there are opportunities, where we don’t have to live in camps and survive off basic aid. 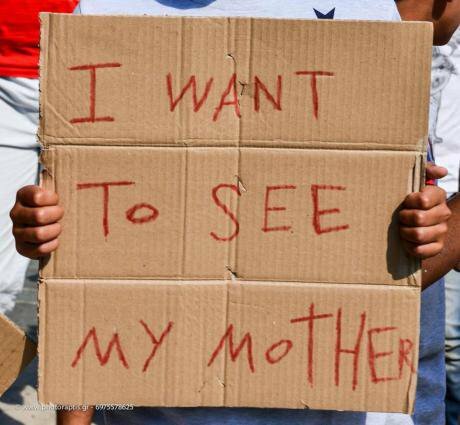 From September 1 – 3, 2016, I took part in the nation-wide protests in the Konitsa Refugee Camp in Northern Greece, along with 130 refugees from our camp. Even as demonstrations took place in the whole country, it was difficult to convince our camp to take part in the protest. We don’t believe that the media care about us, and it is hard to convince journalists and newspapers to cover our stories, even though we desperately need people to listen to us. Konitsa Refugee Camp protests. Lampros Raptis. All rights reserved.But we organised. We coordinated through Facebook, to keep up to date with how protests were going elsewhere. We shared pictures and experiences of protests throughout Greece. Although we heard about some police violence and intimidation at demonstrations in Thessaloniki, we made sure to talk to the police in Konitsa beforehand and to get help from the local people to ensure that the protest was peaceful and lawful. In the end, we staged a sit-down protest in the town square, followed by a march through the town. We took steps to reassure the town that we would not trash anything or do anything that could be bad or negative for the people of Konitsa. We went out onto the street. We held banners thanking the people of Greece but also making clear our problems, and stating our requests for opening the borders, providing better care in the camps, and enabling us to achieve a dignified life and future. These are just the start of a number of demonstrations which will continue until we can convince people to listen and change the situation. 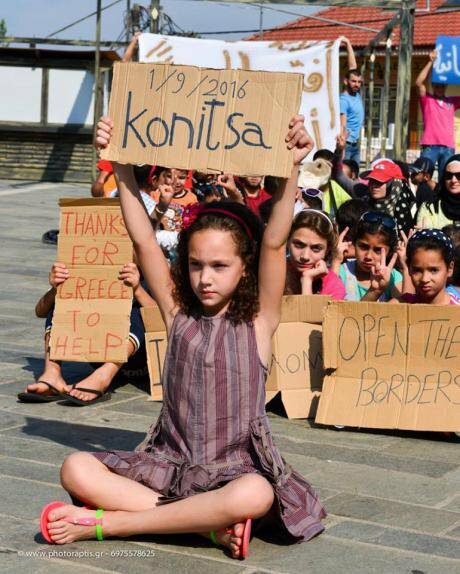 Konitsa Refugee Camp protests. Lampros Raptis. All rights reserved. I am a human, speaking to you. I am a Syrian refugee. I am 17 years old. I have family waiting for me in Germany and I cannot reach them. I am part of the UN reunification programme but I do not know how and when this will happen. Legal support is little, information is sparse, and until I hear more about my future, I am forced to wait and wait – for many weeks, months and maybe years. I am trapped here, without news, without purpose, without my family. We need to spread the word about our situation. If there is anything you can do, do it; just do it. I am a human, speaking to you. All photos and media are to be accredited to Lampros Raptis.